Family stickers is one of our most popular ranges of stickers and it’s not hard to figure out why. It doesn’t matter how old you are or how long you have been scrapping, chances are you have created a layout or two (or two hundred) featuring members of your family. After all, preserving your family memories is probably one of the main reasons you scrap. Stickers with family motifs, quotes and titles allow you to create sensational and heart-warming scrapbooking layouts with ease. You don’t have to spend hours making up hand-made embellishments or procrastinating about how to decorate your pages. Family stickers take care of that for you, leaving you free to just have some fun and enjoy reflecting on your treasured family moments. It is important to choose the correct stickers for your family layouts. Of course, the most vital factor is that you love the stickers you have chosen. Never work with a product that you don’t absolutely love! 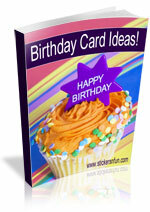 It takes away all the fun of scrapbooking and leads to disappointment with your creations. Materials Used: Dark brown textured cardstock (for the background), Provo Craft Circles paper, Doodlebug Designs Blue Stripe paper, white cardstock, dark blue cardstock, two light blue brads and Autumn Leaves Love & Laughter stickers. This layout could then either feature a photo of my Dad or a photo of my Dad and me together. How often have you looked at old photos and wondered who on earth the people in them are and why they are important to your family’s memories? By using specific family title or quote stickers like this you can quickly and easily record the relationship the people in the photo either have to you or to each other. And then when you and your family look back on them in years to come, it’s easy to see who everyone is. 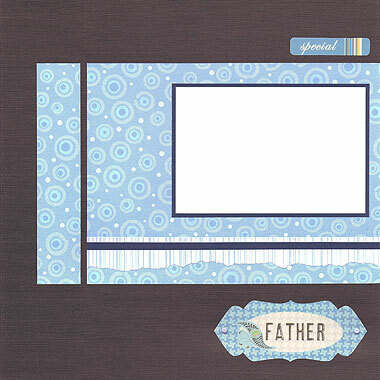 Scrapbooking companies like Flair and Reminisce have realised the importance of recording this information and have released a large variety of stickers covering all sorts of family relationships including mother, father, brothers, sisters, daughter, son, grandparents, aunts, uncles, cousins and more. While it is important to record who the people in your photos are, after a while it can become a bit repetitious and boring. For example, if you are working on a whole album about your immediate family (say you, your partner and your children) you do not need to identify everyone and their relationships to you and each other on every single page. Instead, you may prefer to record specific memories about the event featured or you may like to reflect on what that person (or people) really mean to you. This is where family stickers featuring sentiments can be a real blessing. They allow you to express your feelings without getting caught up in the terrible struggle of trying to figure out the right things to say. We’ve all had writer’s block before and we all know it’s just not fun. Materials Used: Karen Foster Plum Glaze paper (for the background), cranberry cardstock, K&Company Green & Yellow Striped paper, Creative Imaginations Unit 22 paper, green Bazzill cardstock, cream cardstock and Autumn Leaves Love & Laughter stickers. The ‘Love & Laughter’ sticker reflects how I feel about the events taking place. It’s perfect for any photo/s of loved ones who are smiling and enjoying themselves and it captures the emotions of the moment. The ‘Cherish’ sticker, on the other hand, conveys what the person (or people) in the photo mean to me. It focuses not on who they are but on my feelings about that person (or people). And, of course, there is nothing stopping me from writing their name somewhere else on the page if I still wish to record it. So instead of sitting down and tearing your hair out over what to say, you can capture your most important memories and emotions with simple-to-apply sentiment stickers. 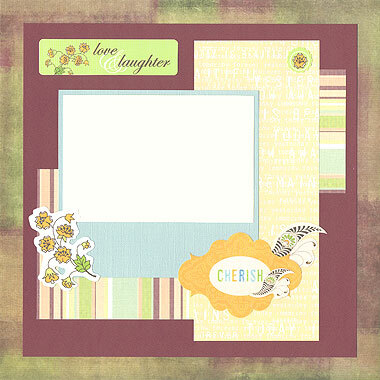 Both types of family stickers have an important role to play in your scrapbooking albums. Before deciding which stickers to use, think carefully about what information you actually want to record. And most of all, choose designs you love! I’d love to hear your thoughts and ideas for using family stickers on your layouts. Please leave a comment in the comments box below. This entry was posted on Wednesday, September 16th, 2009 at 9:54 pm	and is filed under Family, Scrapbooking Stickers. You can follow any responses to this entry through the RSS 2.0 feed. You can leave a response, or trackback from your own site. I really like what you’ve done with these stickers and I love the colour combinations and coordination. When I’m not scrapping my trips, I do the family and wish I had found your stickers early. You have a lovely range on offer. The family tree embellishments interest me to as that is an area I have yet to tackle, so ideas are very good. Thanks for a very helpful blog. facts concerning my presentation focus, which i am going to convey in institution of higher education.